The White Sox? Check, a World Series title in 2005, their first since 1917. The Red Sox? C'mon, didn't you see one of the 129 tomes touting that 2004 title, their first in 86 years? (And they won again last October, so greater Bostonians, please spare us any more soppy, self-pitying salutes to Pesky, Yaz and Teddy Ballgame.) As another October arrives, there's only one baseball team yet to shed its truly historic loser label. Sure, the Cleveland Indians have been championship-starved since 1948. But when you haven't won a title in, literally, a century, like those lovable, laughable Chicago Cubbies, a 60-year losing streak seems like just a few bad days at the office. "I defy anybody to say that there has ever been a team who will be a more sentimental favorite on the American sports scene than the Chicago Cubs will be this year," says Fox baseball analyst Tim McCarver. Even their ballpark is a sentimental favorite. With Yankee Stadium shutting down this season, Chicago's Wrigley Field joins Boston's Fenway Park as the only quirky, old-school ball field left in the game. Shouldn't its ivy walls and Bleacher Bums finally be treated to a World Series victory? Yes, they should. But more important, with a 97-win team that is arguably the most talented bunch in the majors, they will. There, we said it. The Chicago Cubs will win the World Series this October, delivering the nation a nice distraction from a hurting economy and a rough-and-tumble last month before the presidential election. Here's why. And in case you are wondering: no, none of the players or experts quoted in this story were dumb enough to second our prediction. When Carlos Zambrano, Chicago's 6'5", 255-lb. ace, is on his game, few pitchers in the majors are more lethal. Just ask the Houston Astros, against whom Zambrano pitched a scarily dominant no-hitter on Sept. 14 in which just two balls left the infield. "The balance that the Cubs have is tremendous," says Astros general manager Ed Wade. "But I think one thing that separates one club from another is the ability to have a true top-of-the-rotation starter. They've got that in Zambrano." Talent alone doesn't distinguish Zambrano. There's his passion, too. In fact, he's a bit loony, an emotional whirlwind on the mound, pumping fists when things go his way, screaming at himself when the game turns against him. In the past, that intensity has gotten him in trouble. Last season, he fought his catcher in the dugout during a game. Though old habits emerged during his last two regular-season starts, which were awful, for the most part he's learned to reserve his fire for opposing hitters. "When you get into the postseason, there's a passion, an intensity, an emotion that's necessary, and he has all those ingredients," says Atlanta Braves general manager Frank Wren. "He's matured and learned to channel it in the right direction. It makes him very imposing out there." Big Z's bulk and behavior are an intimidating package. "Good hitters sense when pitchers are lacking confidence or vulnerable," says Kevin Towers, GM of the San Diego Padres. "I don't think you ever look at Carlos Zambrano and feel he's vulnerable. If I'm a hitter, I don't want him to get too upset, 'cause he might stick one right in my neck." 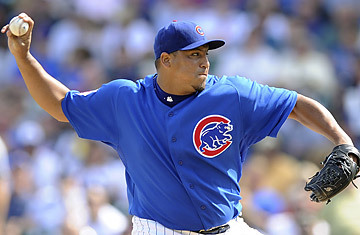 Zambrano offers another surprising postseason weapon: he's perhaps the best-hitting pitcher in the game. This season, he hit .337 with 4 home runs, and in all, he has smacked 16 home runs over an 8-year career. "It's nice to have that type of bat," notes Towers. "I don't say that loosely. If you have that type of bat, you don't have to double switch in a close game, because this guy can do as much damage as anyone coming off your bench. It allows him to stay deep into games and give your bullpen a bit of a breather." Zambrano's talent and game-changing ability are matched by those of his battery mate, rookie catcher Geovany Soto, who is probably the best player you've never heard of. "I don't think there's any question he's the National League Rookie of the Year, and along the way he's probably going to get some MVP votes," says Wade. Soto batted .285 with 23 home runs, none more clutch than the three-run shot he hit with two outs in the ninth inning to tie the Sept. 18 game against division rival Milwaukee (the Cubs won, 7-6, in 12 innings). He drove in 86 runs, tops among the catchers in the playoffs. Soto's work with Chicago's starting-pitching staff is even more impressive than his swing. It's hard enough for any catcher to play both tactician and psychologist for a pitcher. Being a rookie compounds the difficulty of the task. But Soto, 25, doesn't shy away from his elders, and he's won the pitchers over. "This is the same game I've been playing since I was 5," says Soto. "Nobody is going to come in and tell me what's going on. I've always kind of taken charge. I want to have that power." The Cub pitchers also appreciate Soto's ability to separate a bad day at the plate from his business behind the plate. Most young catchers let flailing swings muddle their minds during the games, and a distracted backstop can ruin a pitcher's concentration. But Soto has always let it go. "That's my personality," Soto says. "In talking to my wife, I'll get pissed, and five minutes later, I'm cool. Even if I'm right." Give Soto's homeland some credit for his success. The Puerto Rico native has played five years of winter ball in the Caribbean, experience that makes him wise beyond his years. "Those are big games down there," says Towers. "He is catching big-league pitchers with games on the line. He's used to the pressure."